The 2 large-bedroom apartment is fully furnished and provided with high speed internet. There is a spacious kitchen looking out to a large backyard with a patio and grill. 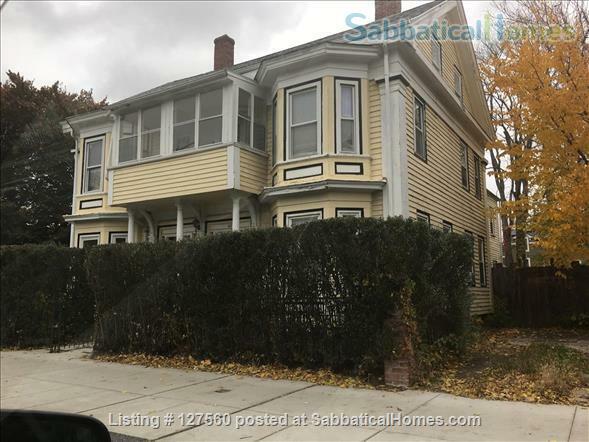 Located in a quiet corner in the heart of Cambridge, it is a 2 minute walk to the red line subway in Central Square, and 10 minute walk to both MIT and Harvard university! It's a 20 minute walk to the Cambridge Technology Center and 30 minute walk to Longwood medical area. Surrounded by a lot of casual and fine dining restaurants. University nearby Boston University, Northeastern, Lesley University, Tufts, Berklee College of Music, all city of Boston colleges basically. Other: Kitchen backdoor is straight to the yard. My name is Latifa Sophia Gourabou, I'm an educator and teacher at Cambridge public schools in Cambridge, Massachusetts. My Husband Armond Gourabou, Ph.D holder and former Harvard linguistic teacher, is currently working as an executive at Russo's Company in Watertown, MA. We are parents of 3 grown-up kids- 2 Boston Youth Symphony Orchestras and college graduates and one on the way. We've lived in many parts of the world and fluently speak English, French, Russian, Spanish, and classical Arabic. Latifa and her husband are fantastic hosts! They made me and my family feel welcomed in Boston and very comfortable in the house. They have accommodated all my requests and have gone the extra mile to ensure we have a fantastic time in Boston. They are very friendly and kind. The apartment is spacious, perfect for a family or a couple. It is furnished and well equipped, and you won't need to buy anything during your stay. The backyard is very nice and we spent a lot of time there during the summer. The apartment is perfectly located to go to Harvard/MIT and explore Cambridge. Public transportation is very close, in Central Sq. The river is close to go for a nice stroll or run. Finally, plenty of good supermarkets are in walking distance.